This is the subject matter which most of us are experiencing in our day to day life. You may not have think about it before. Try to remember you would find out many time you have come across with this type of phenomenon. For example we reached the bus stop in a very hurry but what you do after reaching there? You don't have anything to do except waiting the bus. Also, during the time of college class we reached to class as we thought Lecture has entered the class but most of time have to wait outside more than hours or further longer some time. Most of student those who give attention towards study completed their assignment within the submission date later what happen is that submission date is postponed, they just have to wait longer to checked out their works from lecture. They have done that all in hurry but they have to wait to get checked. They want's appreciation from teacher but they could get that. Some time they may have loss already what they had done and all they have to do is repeat the work. I don't mean not to do your work in time, but kept your work safely. In addition to that those who does later on prepared a nice assignment taking a reference from many other fast doer. So, here waiting one wins the race. But it may not right always. Let's talk about the hurry up and wait phenomenon in the hospital. When you hurriedly reached to Hospital with the patients with specific disease which can be looked by specific doctors if he had gone out side you have to wait until s/he return back or may be s/he within the hospital but may be busy in a critical surgery or in very important work do they give you time? If yes, it's OK. You need not have to wait otherwise there is no option remain other than to wait until s/he get free for you. It's most often in the government office when you reached there you hardly get your work done instantly. They longify the time required to accomplish the piece of work. They directed from one table to next though it can be done by themselves. 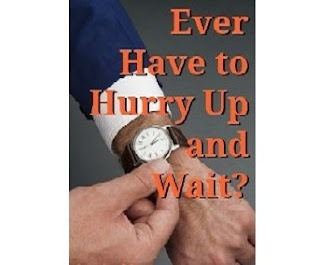 In this situation don' you have to wait although you have reach hurriedly for your work to have completed quickly. It's OK sometimes as most of time they are in holidays or remain outside the office. In that situation you don't need to only wait you should get return back. When we talk about the traffic condition of our country or similar where no. of vehicle is higher than the road capacity the traffic jam occured so there we get the same hurry up and wait.